Living rooms have always given me a strange feeling. It’s how they are arranged: centered around the TV, like a shrine to the talking-box gods. My living room was like this too, up until a few years ago. That’s when I discovered the magic of projectors as a replacement for traditional TVs. A projector all but disappears when it isn’t not in use, since it projects against a blank wall or a screen that can be withdrawn. So when you’re not watching it, it’s just off. 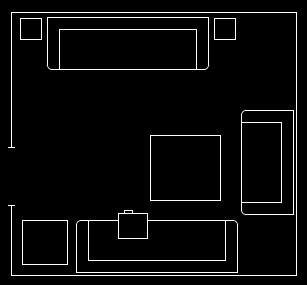 The room can then be arranged in such a way that favors interacting with others (i.e., facing sofas and chairs toward each other). But in an instant the room can be transformed into a home theater. And boy, let me tell you - once you’re used to watching tv, movies, and playing video games on a 10′ screen, it’s really hard to go back to the tiny little box. Projectors have been around for a long while, but they were historically marketed toward office/presentation use, which kept the price out of reach for individuals. In the past few years prices have dropped drastically. For example, here’s one currently selling for $700. That’s still more than the average tv, but not by much. There are some catches, as well as some tricks I’ve discovered in a couple years of owning a projector. So let me lay it all out for you. First, you need a largeish blank wall or a screen opposite your projector. I opt for the former because it’s convenient for my living room. A screen will make the image brighter and crisper, but I’m perfectly satisfied with the image on a wall. You could also potentially make your own screen out of white fabric stretched onto a frame. The projector is hanging from the ceiling (more on this later) above one of the sofas. It projects on the opposite wall, just above the sofa on the other side. So when it’s off, that wall isn’t just empty - people can sit there. To either side of that sofa are a pair of tv trays, draped with fabric so they don’t look lame, which serve as speaker stands. There is a small table just to the left of the back sofa (the main one we sit on when using the projector). This holds the dvd player, video game consoles, and a switchbox to choose between them. The video output from the switchbox goes up the wall behind the sofa to connect with the projector above. We hid our cables behind a tapestry, but you could also paint them white to make them less visible on the wall. The audio output goes to a home stereo amp, which then has standard stereo speakers which go under a rug on the floor to reach the speakers on the other side of the room. Currently I am using SVideo cables to connect the switchbox to the projector, but I’m thinking of going to component video in order to utilize the high-definition mode on my projector. Video games in particular look much crisper in this mode. So yes, you will need to think about cabling to make a projector work, and you will need to provide your own amp and speakers. But chances are you already have a stereo, so it’s just a matter of positioning it to be audible when you’re facing the projector screen. In my opinion this is a bonus: using quality speakers instead of the usual built-in tv speakers only further enhances the home theater experience. One other audio trick I use is a small mixer box. This lets me control the volume of each device independently, and specifically allows me to listen to music from my computer or a CD while playing video games. Most games have an option available in the menu to turn off the music while leaving the sound effects on, which is great because it allows me to supply my own soundtrack. Playing a great game on a 10′ screen with some psytrance or metal blasting in concert with the game sounds rules. 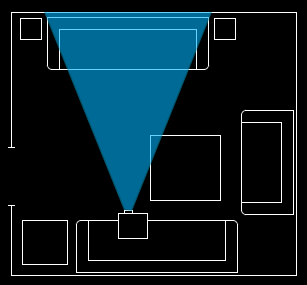 Ambient light can affect projectors. In particular, lower cost models will have a lower light output. (Brightness is measured in lumens on the projector specs.) What this means is that it is harder to see the picture during the day, or at night with a lot of lights on. Personally, I very rarely watch anything during the day, so this is a non-issue for me. If you plan to use the projector in the daytime, I suggest putting the projector in a room that gets little outside light (a basement, or one with thick drapes over the windows). You can also just spend a little more and get a better projector which will be bright enough anywhere. Probably any projector you buy for $1500 or more will be suitable for daytime use. Which brings us to the question of mounting. Most projectors have tons of parameters you can tune to adjust the angle and dimensions of the screen. You’d be surprised how many different angles you can project from and still get a square picture put right where you want it. So there are a lot of options here. The easiest thing to do is set it on your coffee table. This makes it a cinch to run the cables and align the screen, but of course it also consumes a good amount of real estate on your coffee table. And if anyone bumps it or shifts the table, you’ll need to take a minute to realign it the next time you turn it on. The most common method is to set it on a bookshelf that’s sitting next to your sofa. This is also easy, and it makes sense because you can set the dvd player and other output devices right next to it. All this took was a piece of wood cut to approximately the right size, eight screw hooks, four drywall screws, and four pieces of chain. 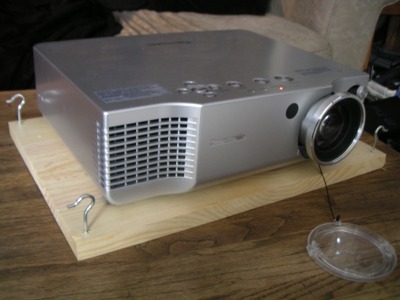 Projectors also require some regular maintenance to keep running. They generate light with a bulb, which gets hot, so there’s an internal fan to keep it cool. The filter on the fan will need to be cleaned out once every 6 - 12 months, depending on how dusty the air in your house is and how much you use the projector. Typically you should clean it once every 300 hours, so if you watch it an hour a day you’ll need to clean it about once a year. 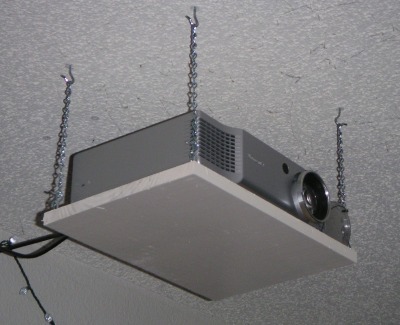 The cleaning process is not particularly difficult, but you do need to take the projector down, pull out the bulb fixture, dust it off, and put it back. It’ll take about 10 seconds to clean it once the bulb is out if you use compressed air. The bulb itself also needs to be replaced, depending on the lamp lifetime specified by the manufacturer. They are supposed to last 1000 - 2000 hours, so that’s several years with moderate use. But this is another expense of owning a projector. Replacement bulbs cost around $300. In case you’re wondering, the projector I have now is the Panasonic PT-AE900U. It cost me about $1400 after a $400 rebate. It’s super bright and crisp, and has an excellent remote that lights up and can also control your dvd player. My second choice was Sanyo PLV-Z4, which from what I’ve read is also a great unit. Although the huge screen is pretty awesome, to my mind the best part is reclaiming my living room as an actual living space. Join me, and together we’ll be the start of a revolution to put an end to tv shrines. Looks good. I’ll be doing something similar but instead of chains, I’m going to use painted 2by4’s. I’ll have to do this because my projector is a little heavier. I’m using a Sanyo PLV-1080HD.